Here in St. Louis, screen porches are more popular than ever. 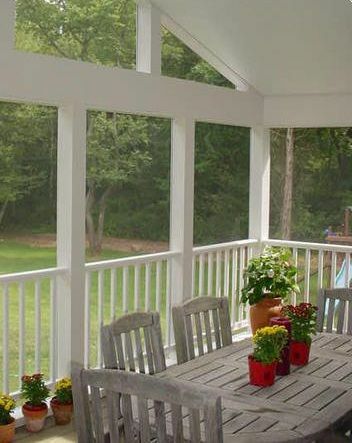 Screened in porches are the perfect in-between space: part house, part yard. From stand-alone porches to attached porches and screen rooms that are combined with a deck or patio (or both), the sky’s the limit when it comes to design and building. So whether you want a porch for its architectural value or simply to get away from the bugs, there’s one for any style and any budget. In our previous posts, Screen Porch Ceiling Options and Screen Porch Roofing Options, we took an in-depth look at the engineering details and materials for hip, gable and shed roofs; vaulted and flat ceilings; exposed and enclosed rafters; accessories too. And just like a roof or ceiling, the walls, windows, doors and floors of a screen porch are distinct elements that make an important constructural and aesthetic impact as well. Pick a flooring for your screened-in porch to influence the look of your space and the price too. From unfinished wood, to tile, to everything-in-between, homeowners have options that will complement their taste and budget. Most often, the floor should reflect the materials seen in a porch ceiling, posts or an attached deck. Pine and cedar woods are favorites. They’re neutral, cost-effective and are easily dressed-up with an outdoor rug. A screen porch floor built with exotic hardwood will, however, need little-to-no accessorizing. Hardwood is elegant but price-wise, hardwoods are more costly. Man-made materials might offer some advantages over natural wood floors. Composite, capped composite and vinyl require very little maintenance and are available in a wide variety of colors. Yet some homeowners view synthetic flooring as an unnecessary expense since the interior floor of a screen porch is protected anyway. Still, other homeowners prefer these newer products. Tile floors look great but some are prone to cracking due to expansion/contraction with temperature changes and moisture. Travertine tile is a great option though. And if you’re screening-in a concrete slab or paver patio, these materials are perfectly fine. 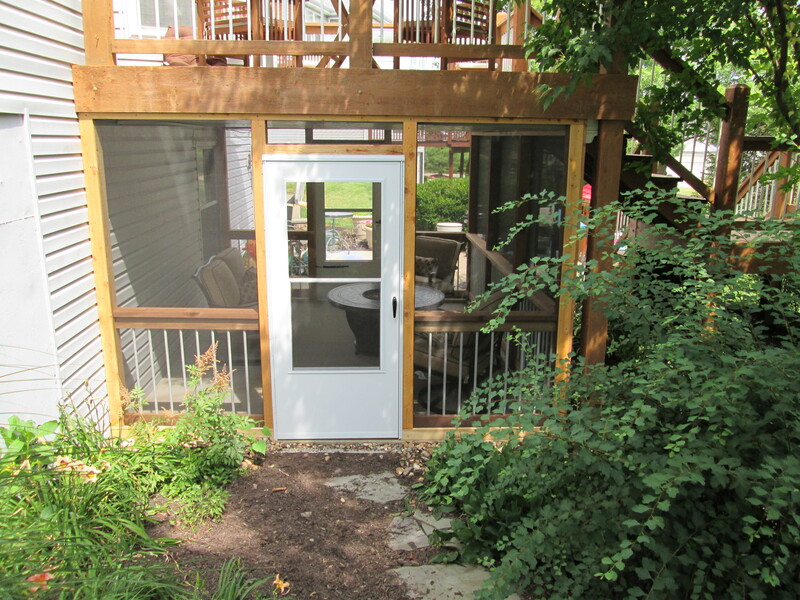 There are two primary considerations for a screen porch door: placement and type. When placing the door (or doors) traffic flow and easy home/yard access are top priorities. Identify and analyze traffic paths and consider the best entries to-and-from the porch. It’s best to plan your doorways with short, direct routes in mind; yet, you’ll want to make sure that conversation areas are uninterrupted spaces. Avoid placing a door behind another door. Instead look to the sides or edges of a room for door placement. What type of door should you use? Single doors, double doors, sliding doors and French doors are possibilities. There are doors made from wood, vinyl and aluminum, each available at different price-points. So when it comes to choosing a door, consult a pro to avoid a door that rots, sags or is ill-fitted. Most homeowners choose traditional screens for their porch. And just like flooring and doors, there are alternatives when it comes to screening products too. Options include aluminum, stainless steel, fiberglass and specialty screens designed for the wear-and-tear of pets. Retractable window systems such as EZE-Breeze, are an alternative to screens and extend the use of a porch into colder weather. Window tracks slide up and down as needed and can be left open all spring and summer but moved up in the fall and winter. EZE-Breeze windows are made with a powder-coated aluminum frame and clear, vinyl window panes. Functional. Stylish. Easy to clean. 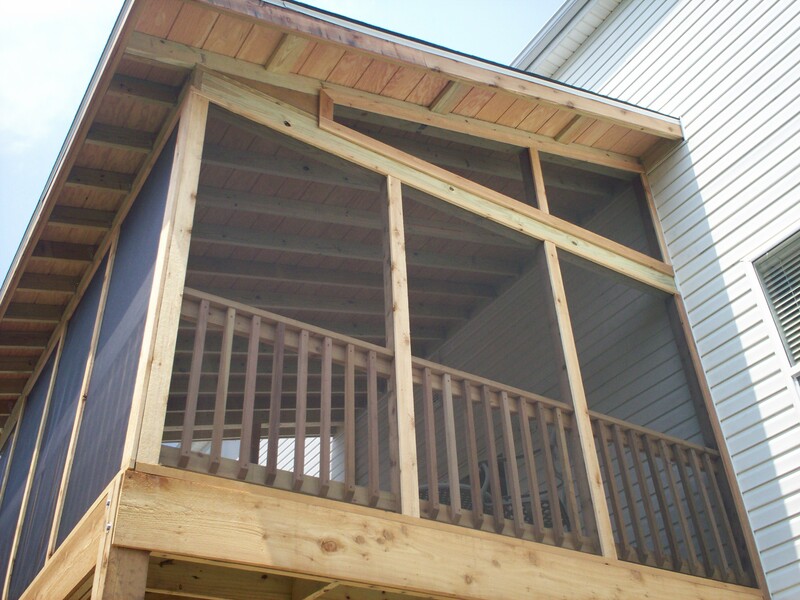 Wall-wise, both screens and retractable windows leave little space for interior wall finishes; however, most screen porches require some type of railing that will fill-in the ‘wall’. Instead of a standard rail design, folks often choose solid kneewall porch rails for safety, privacy and a place for electrical outlets too. Be sure to talk to a knowledgeable builder about these options and your local building code requirements when it comes to screen porch ‘windows’ and ‘walls’. 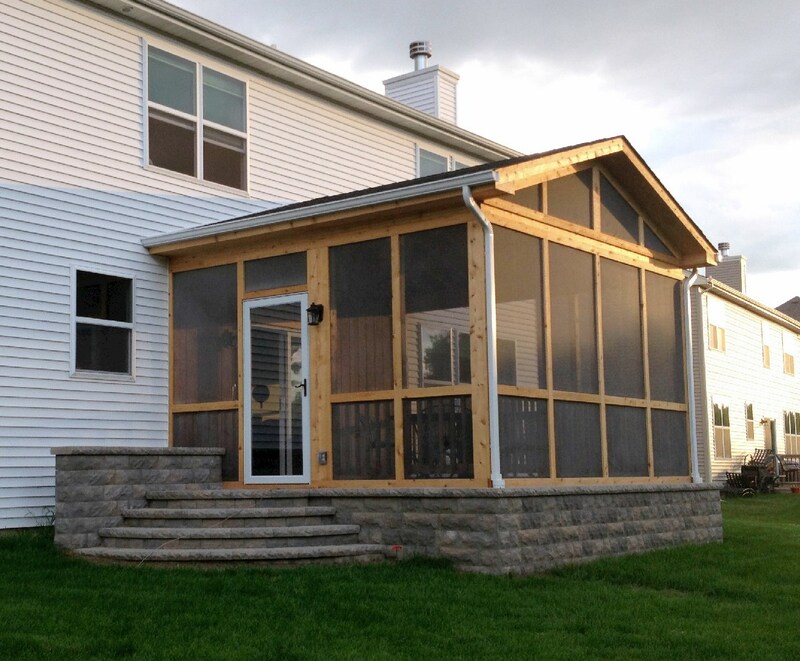 As you can see, a screen porch addition involves many considerations – architectural, aesthetics, safety, price. Flooring materials vary widely in look and in cost. Wood porch floors are the most popular from typical pine to exotics like Ipe. Synthetic floors are common too. 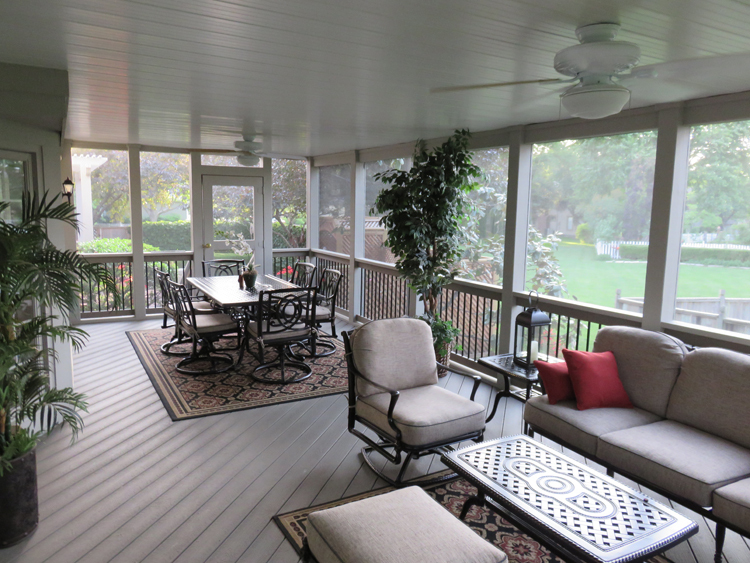 Particularly when a screen porch and deck are adjoined, it makes sense for the floors to match. Existing patios are durable, weatherproof and the least expensive ‘floor’ around! Choose doors that are well-fitted, durable and placed to maximize traffic flow. 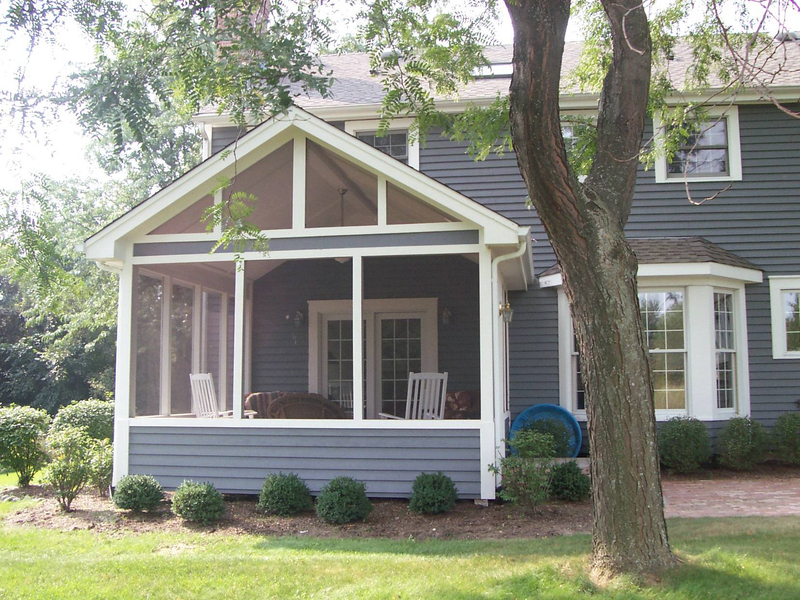 Choose a screen porch ‘window’ that best suits your regional climate and your pocketbook too. And to find out which safety rail is right for you, consult with a professional porch contractor in your neck of the woods. But with the right design and blueprint, there are porch floors, doors, walls and windows to fit any style and any budget. 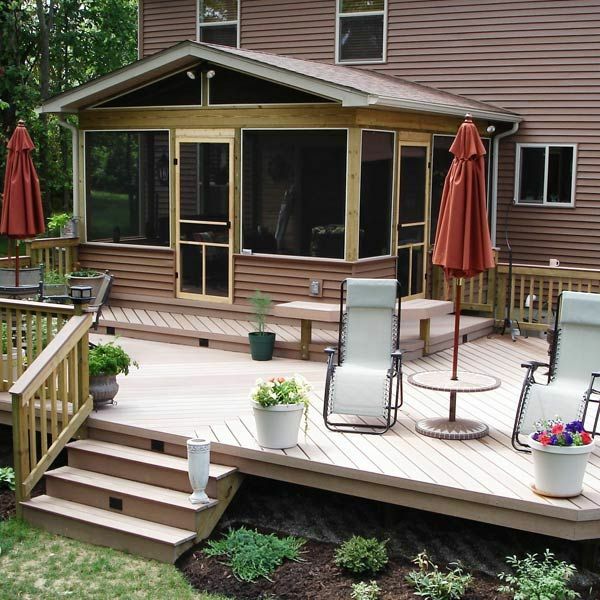 If you live in the Greater St. Louis, Missouri area, and you’re interested in adding a deck, screen porch, shade pergola or other outdoor space to your home and backyard, please visit our website, west-county.archadeck.com. Send us an email or submit the simple, online contact form, “How Can We Help?”. If you’re ready to schedule an appointment now, just pick up the phone and give us a ring 636.227.0800. We offer free estimates and we’d love to talk with you! We’re locally owned and operated, located in St. Louis West County and backed by the Archadeck brand. If you’re still exploring ideas, visit our new Pinterest and Google+ pages. They are a resource hub of inspiration from Archadeck and all around the web too. Outside of St. Louis, Missouri? Call 888-687-3325 or visit archadeck.com.